Bacuna or Lowton? That is the Question. The Aston Villa right back dilemma. Bacuna or Lowton? The Aston Villa right back question. It was only a few seasons ago, when Martin O’Neill seemed to think that a recognised right-back in top level football was surplus to requirements. Until O’Neill finally signed Luke Young in the summer of 2008, he had got by playing centre-backs like Olof Melberg and Carlos Cuellar in the position. Their height and physique was good for defending corners, but didn’t exactly add any fluency or finesse down the right flank, when Villa went forward. O’Neill wasn’t the only guilty manager in recent decades to devalue the position, after all, Ron Atkinson converted Earl Barrett, an outstanding centre-back during his time at Oldham, to play right-back for Villa. Again, athletic and robust in defence, but beating his man and whipping in a cross in the opposition’s half was hardly Barrett’s forte. Now though, Villa’s current manager Paul Lambert is blessed with a choice of genuine talent in the position. With the season now in full flow, with the international breaks done and dusted, the Villa boss has, as the cliche goes a ‘selection headache’. If you asked any Villa fan who was one of our most consistent performers last season, I’m sure the lion’s share would agree that Matt Lowton is in this category. However, the Villa right-back seems to be suffering ‘second season syndrome’ and found himself on the fringes at times this season.This is partly to do with how the adept and versatile summer signing Leandro Bacuna, has settled into the right-back position. Bacuna’s first start came at Carrow Road, the game in which Villa recorded their first clean sheet on the road since The Stadium of Light on the 3rd of November 2012. This was followed up by another clean sheet on the road away at Hull, then another at Upton Park (where he was used as a LWB, Lowton played RWB). Three away games with Bacuna in the defence, three clean sheets. Coincidence?Despite Bacuna’s misplaced pass that led to West Brom’s second goal at the Hawthorns, overall the improvement can’t just be simply considered a coincidence. However, I’m sure a lot of Villa fans will be scratching their heads at Lowton’s sudden exclusion from the team, especially after he was tipped for England at the end of last season. Bacuna, the supposed ‘utility’ player has won over Lambert in the right-back position and at the moment with his deadball prowess, is definitely one of the first names on the teamsheet. Getting forward is vital in the right-back position and it’s something that Bacuna and Lowton both feel natural doing, but which of the two is the most effective? Matty Lowton loves to venture down the right and often links up with forwards who have floated over into wide areas, Weimann or Gabby usually. His passion to attack can be seen by the diagram below, which shows his average positions on the field of open play in the games against Newcastle. The position of the players name indicates their average position in the game. 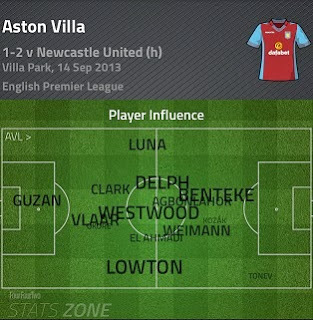 Lowton is the focal point of a lot of our attacks. The chances he creates are creative and effective. He is an excellent crosser of the ball, swinging the ball in from deep areas at times, often onto the six-yard box line, which puts the opposition under immense pressure. Last season Lowton scored two sublime goals, which were of a high importance and made three assists, in 37 games, not a bad return for a right back. Bacuna also loves to get forward, mainly because his natural position is out on the wing. Bacuna has played in 10 games, so far this season, created several chances and scored two goals, both game-changing wonder free kicks. Those free kick may give Bacuna an edge in the right-back battle on-top of the basic attributes, as with his dead ball prowess, he can win a game in an instant. 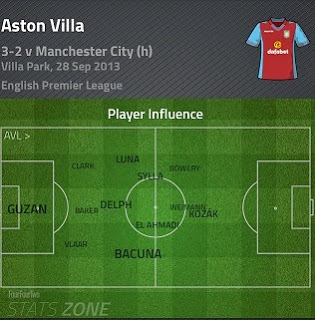 Bacuna’s average positions on the field of play are slightly behind Lowton’s. 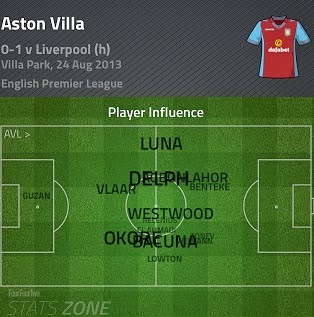 These stats show we have more of an attacking full-back in Lowton. Bacuna’s average position against Norwich is quite far back for example, which is probably why we only had 35.8% possession in that game. However his field position against Man City is quite something, considering we only had 33.3% possession in that game. His position against Liverpool is similar to Lowton’s, who’s name you can see below his, so he can attack when he wants to, but is perhaps not as daring or as adventurous as Lowton is, despite also having plied his trade previously as a winger. Considering what both have offered to the team going forward, a combination of both players regularly in the first 11 could be the answer? Unless Lowton can convert successfully into a right midfielder, Bacuna should be utilised further up the pitch with Lowton playing behind him. Lowton’s first time crosses are too good to be sat on the bench, but Bacuna’s flair and dead ball brilliance also puts him in the same category, and could be catered in the midfield or even as a winger (if Marc Albrighton fails to impress on his return from being on loan with Wigan). “It’s possible that Lambert still isn’t sure where Bacuna’s best position is”, the same as he seems to think playing a centre forward on each wing is ok.There you have the answer,Lambert doesnt seem to know much at all….. I hate that we seem to have to choose between them. They are 2 of our better players, both can offer a lot and right back isn’t even Bacuna’s preferred position. Play Lowton right back with Bacuna in midfield. I really do think our midfield will have a lot more going for it as this season progresses. Bacuna and Gardner are 2 players with big potential, that can score goals, create chances and have a physical presence. If we can get either of them fit and on form alongside Westwood and Delph, I think we will start to look a much better team.